It’s the Rosetta Stone of my wordview, really. 1986. This is the first comic book I ever bought, from one of those HEY KIDS! COMICS! spinner racks in a 7-Eleven somewhere on the south side of Chicago. I think I had stepped out from some kind of an event for a distant relative. I was very young. Anyway, I found it again in a Midtown Manhattan comics shop this weekend. When I pointed it out to my girlfriend, she said she wanted to buy it for me. A sweet gesture, especially considering the price tag of $6 — 800 percent what I paid for my long-lost copy in what the indicia at the bottom of page one tells me was 1986. Some of the best comics ever published came out that year: Watchmen, MAUS, The Dark Knight Returns, Love & Rockets, etc., etc. I wouldn’t find out about those until later. They didn’t sell those comics in 7-Elevens. I must’ve picked this up because I watched the G.I. JOE animated TV series that aired after school, and I owned many of the toys that both the cartoon and the comic book obviously existed to promote. The comic book got its own TV ads, separate from the commercials for the toys; I’ve never heard of another comic book being advertised on television. On the TV show, the characters fired evidently nonlethal laser guns at one another. But the comic book, I learned, was very interested in details of the design and operation of real-life firearms. That was how I segued into buying the similarly trigger-happy vigilante series The Punisher — the express shuttle between G.I. JOE and the Marvel Universe. Reaching a double-digit age, I grew out of action figures and right into comic books, mostly because a comics and used books specialty shop happened to open up within biking distance of my house. It was 1988 when I bought my first issues of Batman and Detective Comics (starring Batman) and The Uncanny X-Men. 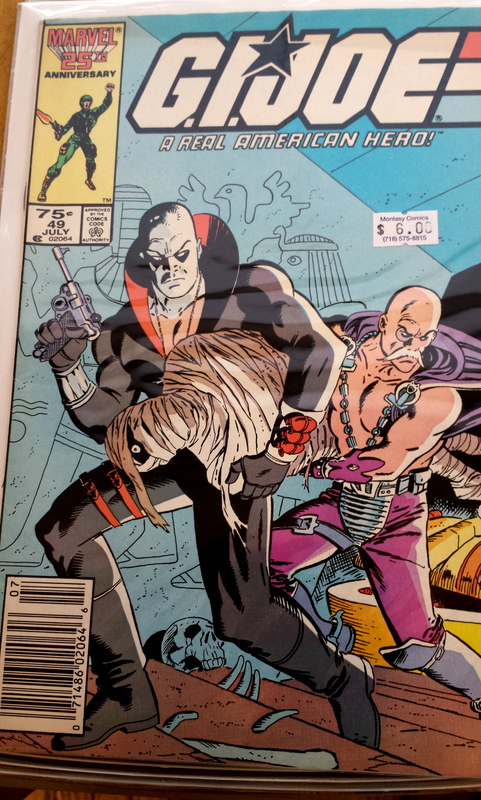 I got my first issue of the whimsical, criminally undervalued indie sci-fi comic Nexus that year, too, which I still try to get discerning comics people to read. (Incredibly, the writer and co-creator of the funny, sensitive Nexus, a man named Mike Baron, was cranking out macho shoot-’em-up scripts for The Punisher at the same time.) I got the pricey ($12.95!) collected editions of The Dark Knight Returns and Watchmen that year, too. They were more than a little sophisticated for me at the time, but that was exactly why I bought them — they’d been recommended in Rolling Stone! — and why I loved them. When Sandman No. 1 appeared near the end of that year, I snatched it up, and every issue afterward. So to recap: My comics trajectory went from G.I. JOE, military action for boys, to Sandman, beloved by comparative lit majors in black nail polish of all ages, in a little over two years. It would take much longer than that for me to begin to understand Sandman properly, but I was at least intrigued enough to keep buying it. Anyway, let’s unpack the most potent gateway drug I ever tried: G.I. JOE: A REAL AMERICAN HERO! #49. This entry was posted in comics, Uncategorized and tagged Captain Marvel, close reads, comics, comics panels, G.I. JOE, nostaliga, Watchmen. Bookmark the permalink.